The world premiere of the documentary film One Path: The Race to Save Mongolia’s Giant Salmonids will take place at the Paramount Theatre in Denver on November 4 at 5:30 p.m. Ticket proceeds go to benefit The Taimen Fund. Outdoor Channel and Sportsman Channel Documentary Celebrates World Premiere of “One Path: The Race to Save Mongolia’s Giant Salmonids” at the Paramount Theatre in Denver on November 4, 2018, at 5:30 p.m.
Tickets on sale at altitudetickets.com. 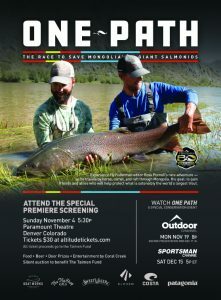 DENVER (October 4, 2018) – Outdoor Channel and Sportsman Channel, in cooperation with Fly Fisherman magazine, will celebrate the world premiere of the documentary film One Path: The Race to Save Mongolia’s Giant Salmonids at the Paramount Theatre in Denver on November 4 at 5:30 p.m.
Join Fly Fisherman magazine publisher and editor Ross Purnell as he embarks on an epic journey by horse, camel and raft through Mongolia, the land once ruled by historic warrior and emperor Genghis Khan, in search of the fly-fishing experience of a lifetime and the giant, freshwater salmonid species known as Taimen. Purnell documented his journey in hope of calling attention to the plight of the giant trout-like fish (trout, salmon, char) that face potential extinction from the region because of overfishing, toxic mining practices, along with the construction of roads and dams infiltrating the pristine country and waters that are home to this rare species. Along the way, Purnell and his team also befriended and taught local men, women and children how to fly fish, provided them with equipment and supplied key medical and dental provisions to aid the Mongolian tribal people who live along the rivers. “This experience is the culmination of a dream of fly-fishing for this elusive apex predator in its natural environment of Mongolia, as well as call attention to the real conservation issues facing the species, educate tribal villagers living along the rivers on how to fly fish and provide medical and dental aid to this somewhat forgotten group of descendants from one of the world’s once most powerful and historic empires,” Purnell said. The film premiere of One Path: The Race to Save Mongolia’s Giant Salmonids also is a celebration of Fly Fisherman magazine’s 50th Anniversary of publication. All ticket proceeds from the event premiere will go to The Taimen Fund. Along with the film premiere, a silent auction benefitting The Taimen Fund will take place and include: original works by artists Garrison Doctor and Josh Udesen; a special-edition drift boat from Boulder Boat Works; a trip to Mongolia provided by Mongolia River Outfitters; and much more. Special guests will include: Taimen researcher Lanie Galland (University of Nevada, Reno) and Mongolian fishing guides Battulga Tumenjargal and Жангар Батаахүү (Janger). Both guides are featured in the film and are traveling to Denver from Mongolia to participate in the film premiere. Music will be provided by Coral Creek and SweetWater Brewing Company will unveil a special new beer. Tickets are on sale at altitudetickets.com. The film will debut on television on Outdoor Channel, November 19 at 8 p.m. ET and air on Sportsman Channel, December 15 at 5 p.m. ET.